Astronaut Scott Kelly posted this photo taken from the International Space Station to Twitter on Sept. 5, 2015 with the caption, “#goodnight #Earth! Make me proud and I’ll try and do the same. #YearInSpace”. With the second half of their mission underway, a pair of One-Year Crew members continued a series of biomedical experiments this week. The six-member Expedition 45 crew is also getting ready for a new space shipment due early next month. Commander Scott Kelly and Flight Engineer Mikhail Kornienko have been teaming up for a variety of human research studies in space since March. Scientists are observing the effects of living in space on long-term crew members. This week the duo explored head pressure and visual impairment some station astronauts have experienced to help NASA prepare future crew members for the Journey to Mars. The next cargo mission, ISS Progress 61 (61P), to the International Space Station is scheduled to launch Oct. 1 and dock six hours later to the rear docking port of the Zvezda service module. A pair of cosmonauts practiced the techniques Friday they would use in the unlikely event it became necessary to use the Zvezda’s telerobotically operated rendezvous system to manually dock the 61P. A Cubesat is ejected from a deployer mechanism on the outside of Japan’s Kibo laboratory module. Human research studies continued on the orbital laboratory today, aiming to help scientists understand the long-term effects of living and working in space as NASA prepares for the Journey to Mars. Also, more small satellites were deployed outside the Kibo laboratory module. The One-Year Crew members Scott Kelly and Mikhail Kornienko continued the Fluid Shifts study with eye checks Thursday. The experiment studies pressure inside the head and visual impairment some astronauts have reported experiencing on long-term missions. NASA astronaut Kjell Lindgren performed ultrasound scans for the Sprint exercise study to help keep astronauts in shape while living in space. Japanese astronaut Kimiya Yui was inside the Kibo lab monitoring the deployment of two sets of nanosatellites outside the lab module. 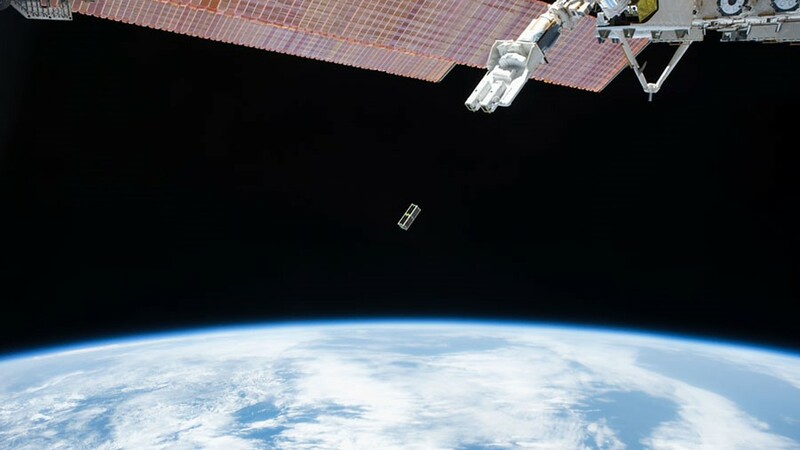 The nanosatellites were delivered aboard the “Kounotori” HTV-5 resupply ship last month some of which will aid in air and vessel navigation, meteorology and meteor shower observation. Cosmonauts Sergey Volkov, Oleg Kononenko and Kornienko worked on their complement of Russian research and maintenance. The trio explored new tools and techniques to locate pressure leaks inside the station. They also looked at ways to improve the performance of cosmonauts on such things as spacecraft piloting tasks. 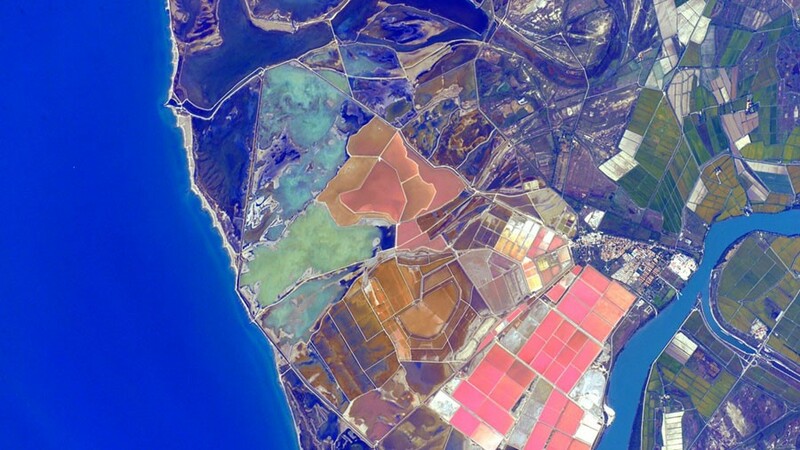 Astronaut Scott Kelly posted this photo of Spain taken from the International Space Station on Instagram with the caption, “Color palette of the #Spanish coast is an appealing morning view. #GoodMorning from @ISS! #YearInSpace #colors #colorful. 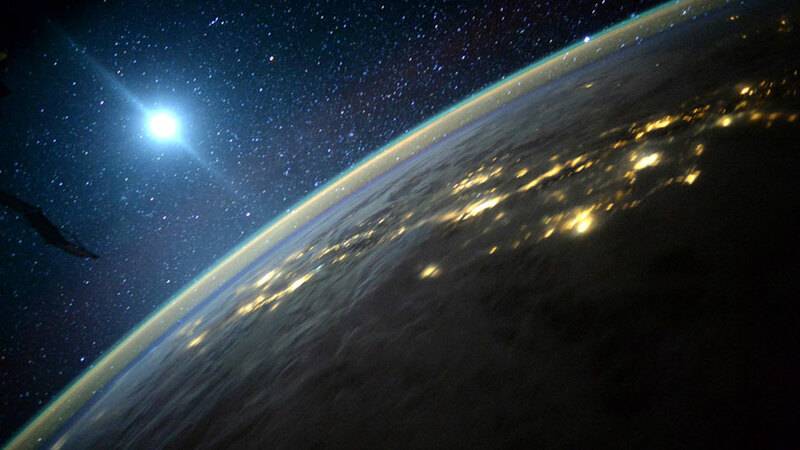 #earth #space #spacestation #iss #morning”. One-Year Crew members Scott Kelly and Mikhail Kornienko just completed the half-way point of their 342-day mission. The duo, who are scheduled to come home March 3, 2016, are participating in numerous life science experiments. Scientists from around the world want to learn how the human body adapts to long-term space missions so NASA can prepare for the Journey to Mars. Read more about the One-Year Crew’s midway point. Kelly and Kornienko participated in the Fluid Shifts study Wednesday morning performing ultrasound scans on themselves. The long-running human research program explores brain pressure and visual impairment some astronauts have experienced due to microgravity affecting the direction of fluids in their bodies. Kelly later joined Japanese astronaut Kimiya Yui transferring cargo to and from Japan’s “Kounotori” H-II Transfer Vehicle-5 (HTV-5) resupply ship. 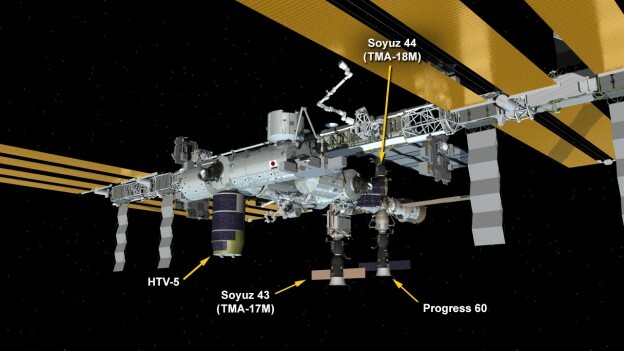 The HTV-5 will end its mission at the International Space Station Sept. 28 when it will be robotically released from the Harmony module for a fiery destruction over the Pacific Ocean. 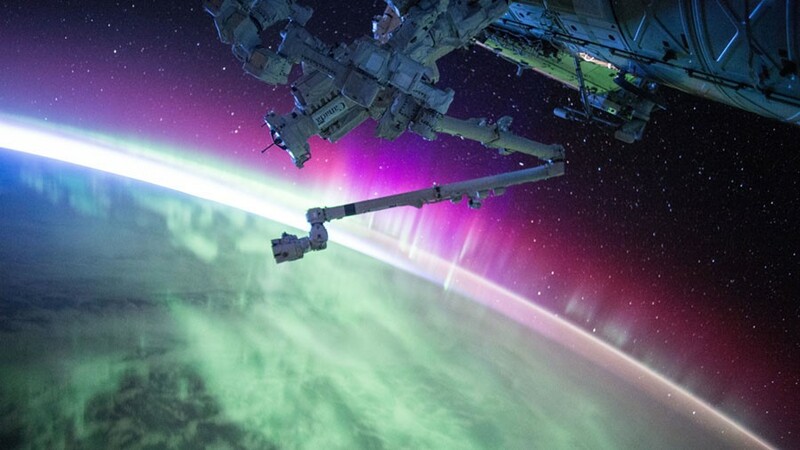 Astronaut Scott Kelly posted this photo of an aurora taken from the International Space Station to Twitter on August 15, 2015 with the caption, “Another pass through #Aurora. The sun is very active today, apparently. #YearInSpace”. NASA astronaut Scott Kelly and Russian cosmonaut Mikhail Kornienko clocked in for their 171st day aboard the International Space Station since arriving on March 27. The pair, set to come home March 3, 2016, are spending 342 days in space to help researchers better understand how the human body reacts and adapts to long duration spaceflight. Read more about the One-Year Crew’s midway point. Meanwhile, a pair of first-time astronauts transferred gear to Japan’s “Kounotori” HTV-5 cargo craft. NASA astronaut Kjell Lindgren and Japanese astronaut Kimiya Yui conducted robotics work inserting an experiment platform into the side of the HTV-5 after the research it had delivered was installed on the outside of the Kibo lab module. The HTV-5 resupply mission will end Sept. 28 and the cargo craft will be released for a destructive entry over the Pacific Ocean. 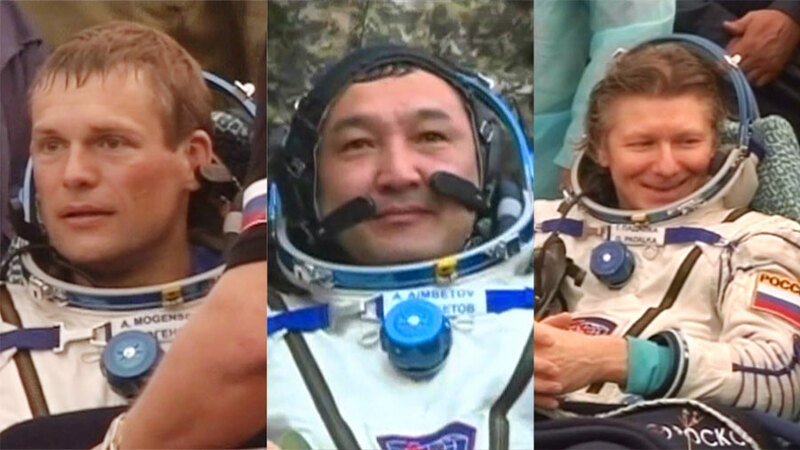 Three crew members from the International Space Station returned to Earth on Friday. The landing in Kazakhstan wrapped up a 168-day mission for one cosmonaut and a brief 10-day visit for two, as well as returned a cache of samples from several NASA human research experiments aboard the station. Expedition 44 commander Gennady Padalka of the Russian Federal Space Agency (Roscosmos) and visiting crew members Andreas Mogensen of ESA (European Space Agency) and Aidyn Aimbetov of the Kazakh Space Agency touched down at 8:51 p.m. EDT (00:51 UTC, 6:51 a.m. on Saturday, Sept. 12, Kazakhstan time) southeast of the remote town of Dzhezkazgan in Kazakhstan. Russian recovery teams will help the crew exit the Soyuz vehicle and adjust to gravity after their stay in space. Padalka arrived at the International Space Station on March 27 along with one-year mission crew members NASA astronaut Scott Kelly and Mikhail Kornienko of Roscosmos. Padalka spent 168 days in space during Expeditions 43 and 44, traveling more than 71 million miles. This completes Padalka’s fifth trip to space for a total of 879 days in space, the most by any human. Mogensen and Aimbetov spent 10 days in space, delivering a new Soyuz spacecraft that will return Kelly and Kornienko and Russian cosmonaut Sergey Volkov in March. 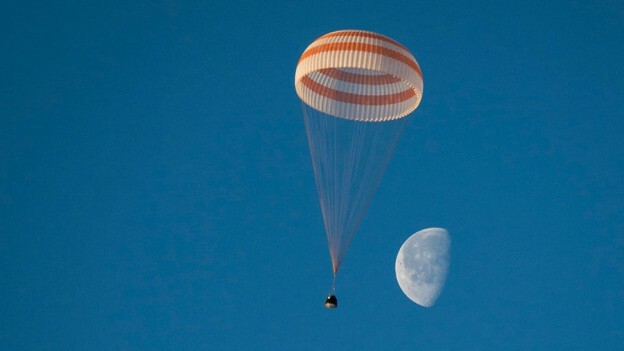 They arrived with Russian cosmonaut Sergey Volkov, who will return to Earth with Kelly and Kornienko in March 2016. It was the first flight to space for both Mogensen and Aimbetov, who made 160 orbits of Earth and traveled more than four million miles during their 10 days in space as visiting crew members. During their short time in orbit, they participated in a number of experiments on behalf of their respective space agencies, focusing on the areas of human research, Earth observation and technology development. They arrived with Russian cosmonaut Sergey Volkov, delivering a new Soyuz spacecraft in which Volkov, Kelly and Kornienko will return to Earth in March 2016. NASA experiments returning on the spacecraft include blood samples for NASA’s Twins Study, a unique research demonstration using Kelly and his twin brother, former NASA astronaut Mark Kelly, to understand the effects of long duration spaceflight and further NASA’s use of personalized medicine in space. Additional samples for the Salivary Markers and Microbiome studies also returned to Earth. One item, the Skinsuit, was tested in orbit by ESA astronaut Andreas Mogensen. Some astronauts’ spines have been shown to lengthen as much as 7 cm in weightlessness, which can cause pain. The Skinsuit was demonstrated in microgravity to see if it may help astronauts counteract potential back problems in microgravity. The specially designed overalls simulate gravitational forces from Earth by constricting the body from shoulders to feet. Testing this clothing item in space may help astronauts with any back pain they experience on long-duration missions. Further, the Skinsuit has potential use for older adults with spine issues and people suffering from low-back pain on Earth. It also could be used as a support item for people with conditions like cerebral palsy, a disorder affecting movement, muscle tone and/or posture. Samples from one Rodent Research study are returning with this Soyuz flight, as well. These types of experiments examine how microgravity affects animals, providing information relevant to human spaceflight, discoveries in basic biology and knowledge that will have direct impact toward human health on Earth. Remaining aboard the orbiting laboratory to continue important research and station maintenance during Expedition 45 are Kelly, Kornienko, Volkov, NASA’s Kjell Lindgren, Oleg Kononenko of Roscosmos, and Kimiya Yui of the Japan Aerospace Exploration Agency. A Soyuz spacecraft is seen as it lands March 12, 2015 carrying three Expedition 42 crew members. NASA Television is providing live coverage of tonight’s return to Earth of International Space Station Expedition 44 crew member Gennady Padalka of Roscosmos and visiting crew members Andreas Mogensen of ESA (European Space Agency) and Aidyn Aimbetov of the Kazakh Space Agency. The crew undocked from the station at 5:29 p.m. EDT, and they are on track for landing in their Soyuz TMA-16M spacecraft at 8:51 p.m., southeast of Dzhezkazgan, Kazakhstan. Watch on NASA TV at https://www.nasa.gov/nasatv. Follow the conversation on Twitter using @space_station and the hashtag #ISS. The International Space Station configuration as of Sept. 11 when the Soyuz TMA-16M spacecraft undocked from the Zvezda service module. The Soyuz TMA-16M carrying Expedition 44 crew member Gennady Padalka of Roscosmos and visiting crew members Andreas Mogensen of ESA (European Space Agency) and Aidyn Aimbetov of the Kazakh Space Agency undocked from the station at 5:29 p.m. EDT. Padalka spent 168 days aboard the International Space Station during Expeditions 43 and 44 and will complete 2,688 orbits of Earth. Mogensen and Aimbetov spent 10 days in space, eight of them aboard the orbiting laboratory. Padalka is the commander at the controls of the Soyuz TMA-16M spacecraft. They will perform a separation burn to increase the distance from the station before executing a 4-minute, 42-second deorbit burn at 7:59 p.m. The crew is scheduled to land at 8:51 p.m. southeast of Dzhezkazgan, Kazakhstan. The departure marks the end of Expedition 44. The Expedition 45 crew members remaining aboard to continue research and maintenance are Commander Scott Kelly of NASA, NASA astronaut Kjell Lindgren, Russian cosmonauts Mikhail Kornienko, Sergey Volkov, and Oleg Kononenko, and Kimiya Yui of the Japan Aerospace Exploration Agency. NASA Television will air live coverage of the Soyuz TMA-16M deorbit burn and landing beginning at 7:30 p.m.
At 2:17 p.m. EDT, the Soyuz hatch closed between the International Space Station and the TMA-16M spacecraft. Expedition 44 crew member Gennady Padalka of Roscosmos and visiting crew members Andreas Mogensen of ESA (European Space Agency) and Aidyn Aimbetov of the Kazakh Space Agency are preparing to undock at 5:29 p.m. NASA Television will air live coverage of undocking beginning at 5 p.m. Watch live at https://www.nasa.gov/nasatv. The deorbit burn is targeted for 7:59 p.m. and will lead to a landing at 8:51 p.m. southeast of Dzhezkazgan in Kazakhstan. NASA TV coverage of deorbit and landing begins at 7:30 p.m.
Cosmonaut Gennady Padalka (center with red shirt) and first time space visitors (from left in back) Andreas Mogensen from Denmark and Aidyn Aimbetov from Kazakhstan will ride the Soyuz TMA-16M spacecraft back to Earth. Today is homecoming day for International Space Station Expedition 44 Commander Gennady Padalka of Roscosmos and visiting crew members Andreas Mogensen of ESA (European Space Agency) and Aidyn Aimbetov of the Kazakh Space Agency. They are preparing to return to Earth in the Soyuz TMA-16M spacecraft at 8:51 p.m. EDT, southeast of Dzhezkazgan, Kazakhstan. At this time, the crew’s return is on track, and the space station teams are not working any issues. The Soyuz hatch is scheduled to be closed at 2 p.m. EDT. Padalka handed over command of the orbiting laboratory to NASA astronaut Scott Kelly in a ceremony on Saturday, Sept. 5. Expedition 45 formally begins when the Soyuz undocks. NASA Television coverage times for Soyuz activities are listed below. These activities also will stream online at https://www.nasa.gov/nasatv. Here is a timeline of the Expedition 44 undocking and landing. Join the conversation on Twitter @space_station and following hashtag #ISS. To learn more about all the ways to connect and collaborate with NASA, visit: https://www.nasa.gov/connect. 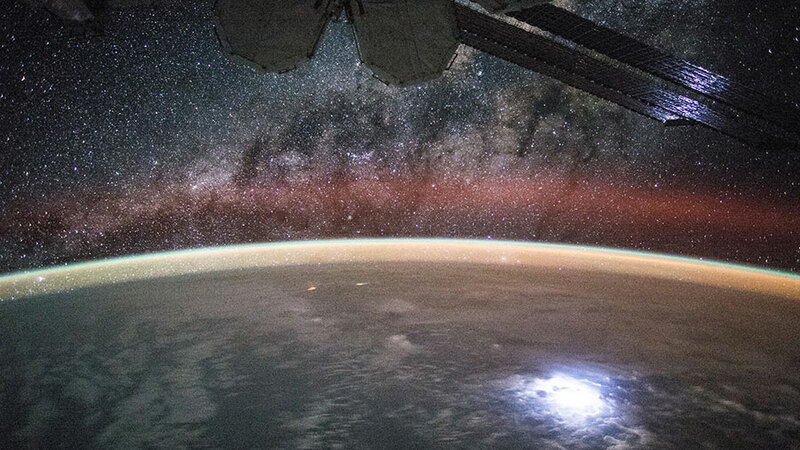 As if the Milky Way in this photo wasn’t enough, Astronaut Kjell Lindgren captured a lightning strike from space so bright that it lights up the space station’s solar panels. Expedition 44 Commander Gennady Padalka is packing gear inside the Soyuz TMA-16M spacecraft for his return home Friday with two first time space visitors. 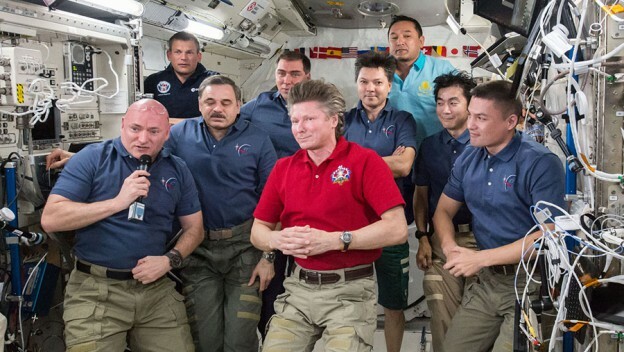 Padalka will be completing his fifth mission for a record 879 cumulative days in space. 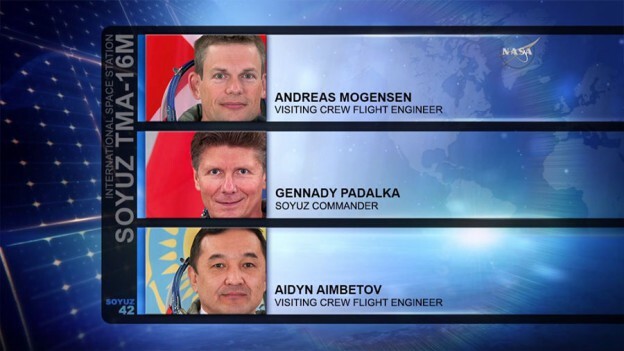 Padalka will be flanked by visiting crew members Andreas Mogensen from Europe and cosmonaut Aidyn Aimbetov from Kazakhstan inside their Soyuz when they undock Friday at 5:29 p.m. EDT (21:29 UTC). They will land in Kazakhstan about three-and-a-half hours later. NASA Television will cover all the activities live, including the crew farewell, beginning at 1:45 p.m. (17:45 UTC). The rest of the crew, which will officially become Expedition 45 when Padalka undocks, continued normal science and maintenance tasks. NASA astronaut Scott Kelly worked with a pair of tiny bowling ball-sized satellites outfitted with special gear to study fluid physics. He was later joined by cosmonauts Sergey Volkov and Mikhail Kornienko to review procedures and hardware they would use in the event of a medical emergency in space. Flight Engineer Kjell Lindgren worked on plumbing tasks before videotaping crew activities with an IMAX camera. Japanese astronaut Kimiya Yui conducted a variety of life science experiments. Finally, cosmonaut Oleg Kononenko worked maintenance on Russian hardware before moving on to Russian science.